My apartment was completely renovated 4 years ago. It is located on the 2nd floor of a 14 story building with elevator. The beach and the bus stop to Benidorm are 100 m away. You can relax on the terrace. The apartment is heated, making it fine for winter stays. Nearby, you find shopping centres for food and restaurants. In the house is a shop with newspapers and across the street there is a baker's shop. Further Details: Fine, sandy beach with clear water which is shallow to the first 50 m. 40 m from the apartment, you find a diving school. From here, you can make excursions to the island straight to Poniente beach for diving. The harbour of Benidorm is 2 km away. From here ships start to the island every morning for sight seeing. In the evening you must walk over the promenade to Benidorm. It is illuminated. If you like to attend a night show, please book the Benidorm Palais. There you can also have diner before the show starts. For your children's pleasure, please pay a visit to Terra Mitica Park. Take time for the whole day. It is beautiful. Surroundings I: Central Benidorm which is often referred to as 'the old town' is where Benidorm originally started in 1953 when it was a small fishing village. Poniente beach is located at the west side. Benidorm is protected and coved by a colossal mountain range as the Sierra de Aitanna. This acts as a fabulous weather barrier, pushing storms inland or back out to sea. The average mild temperature of 21° makes it a popular and active resort that operates 24 hours a day, 365 days a year. There is certainly something for everyone from every social class, age group and cultural background. Terra Mitica Theme Park, Terra Natura Animal Park, Aqualandia Water Park, Mundamar Dolphin Park, the Bullring, Benidorm Palace International Variety Show and a Casino. Surroundings II: island of Benidorm is definitely worth a visit. Go just over a mile out to sea on a sub-aqua boat where the underwater sea life is visible. There is a café on the island for refreshments and it is a natural haven for peacocks, hens and a very rare Mediterranean yellow-legged gull... very interesting for all you 'twitches'. Our beautiful location is directly at the sea side and unfortunately has gnats. Please close the windows and switch off the lights when leaving your apartment during summertime in the evening. Eolo is very well furnished. You have a good view over the beach and the sea. In the area, we have a parking lot for your car. We provide bed linen and towels. You can heat this apartment with a gas oven. It is very warm in the apartment when the sun shines. Across the street you have a baker's shop, in the house there is a newspaper shop and nearby (30 m) a drugstore. A big shopping center is 3 km away (Carrfour). Here you find all the things for your daily life. But you must have a car. Alles was tiptop in orde. Het ligt 2,5 a 3 km van het centrum, dus weg van de enorme drukte daar. Bushalte ligt bijna tegenover het appartement wat heel makkelijk is. Mooi uitzicht op zee.Het appartement is zeer compleet en voelt meteen huiselijk aan. Als ik één tip mag geven, zorg voor een degelijke verduistering op de achterste slpk. Schöne, saubere Wohnung unweit vom Strand, Parkplatz vorhanden, Abwicklung seriös und unkompliziert. Vielen Dank an Herrn Oldörp und Ellen! Tolle Wohnung, am ersten Tag war zwar der Boiler kaputt, aber Ellen hat gleich einen Handwerker für den nächsten Tag bestellt und der war pünktich. Der Vermieter ist auch richtig gut. Die Kommunikation 1a. Sollten Andere auch mal so machen. Die Wohnung ist toll beschrieben und genauso ist sie auch vorgefunden worden. Einziger Mangel ist, dass eine Hauptstr. mit Bus vor dem Balkon ist und somit vor 01.00 h keine wirkliche Ruhe ist. Uns hat es aber nicht wirklich gestört. Was ich persönlich sehr gut fand, war, dass wenig Deutsche dort waren und dafür eben viele Einheimische. Selbst meine Kinder hat es nicht gestört. Strand und Wasser sind super. 50 entfernt ist das SCUSI. Eine tolle Bäckerei, die noch viel mehr bieten, z. B. Salate usw. WLAN natürlich auch. Wir sind sehr erholt zurück gekommen und werden bestimmt wieder dort hinfahren. Ein toller Urlaub im Eolo! Wir haben uns sehr gefreut, nach 10 Jahren mal wieder nach Benidorm zu kommen. Unser Aufenthalt im Eolo hat dazu beigetragen, dass wir (2 Erwachsene, 2 Kinder) eine schöne Zeit hatten! Das Ein-/Auschecken hat, dank Ellen, auch reibungslos geklappt! Vielen Dank nochmal wegen dem Gepäck am Abreisetag, Ellen!! Die Wohnung ist in einem sehr gepflegten Zustand! Alles ist sauber und ordentlich. Die Wohnung verfügt über aussreichend Platz. Deutsche Sender im TV via Satelit. Für August waren wir angenehm überrascht das der sehr breite Strand nicht überfüllt war. Auch die Temperaturen waren für August angenehm, was wohl am Mikro-Klima liegt. Der Service beim Ein/- und Auschecken ist sehr herzlich und nett. Alles in allem kann man im Eolo sehr schön wohnen. Wir können es nur weiterempfehlen. Vielen Dank für die schöne Zeit. Das Eolo ist ein wirkliches Kleinod und wird immer wieder von meinen Gästen gerne gebucht .Nahe am Strand, gemütliche Einrichtung und einen Parkplatz auf dem Hof . Dazu vom Eingang bis zur Wohnung keine Treppe und deshalb sehr für ältere Leute empfohlen . Für mich und meine Mitarbeiten steht der Gast an erster Stelle , geht es dem Gast gut , tut es auch dem Vermieter gut . 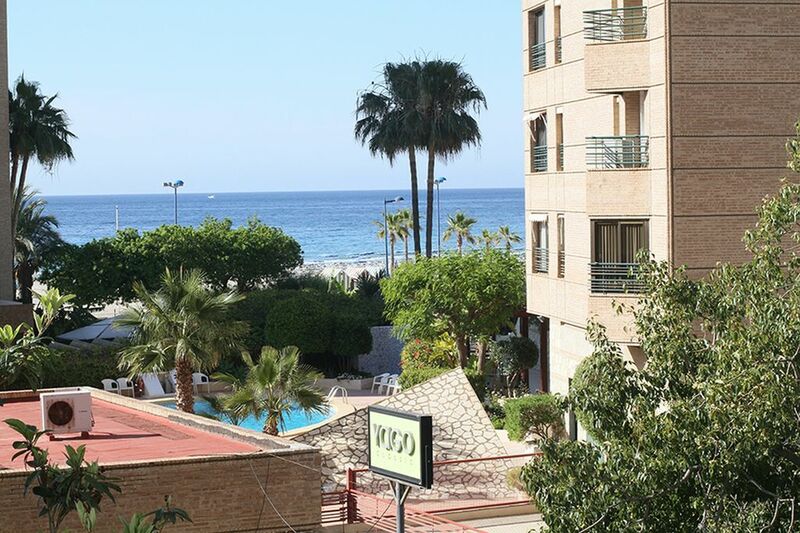 La Cala/Benidorm is located directly by the beach in Poniente Bay. There are no high-rises or industry. The bus stop to Benidorm is right in front of the door. The beach is fine and sandy beach with shallow water at the first 50 meters. If you have a car, you can make excursions to the mountains. In 10 minutes you get to valleys with beautiful views and to very good restaurants with cheap prices and good quality. Benidorm takes its name from the Arabic of ' Bendahrim ', being named after the family who initially colonised the area. Situated between the cities of Valencia in the north and Alicante in the south , it is in the province of Valencia , in the region known as ' La Costa Blanca ' and , which is based in the administrative capital of Marina Baixa. Central Benidorm is often referred to as ' the old town '. Benidorm originally started when it was a small fishing village. Poniente is the west side, where most of the working residents of Benidorm and the Spanish live.